For a supposed best-of, this does Costa, long one of Brazil's best singers, few favors. 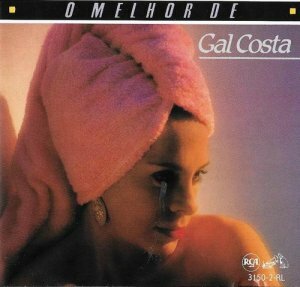 The '80s weren't a great musical decade anywhere, even in Brazil, and so at least the first half of this disc showcases bad synthesizers, rock guitar, and all the other things that made the period heavy going. It gets off to a shocking start with "Brasil" and doesn't really improve for the first eight tracks -- even some sprightly and thoughtful percussion work can't redeem the arrangements. From track nine on things improve a little, but only a little. "Nada Mais (Lately)," a song with a Stevie Wonder lyric, has some personality and subtlety, but soon there is "Um Dia de Domingo," a song so firmly in the middle of the road that it's in danger of being crushed from both sides. There's not even any invention in the song's arrangement. The lightness of "Topazio" redeems things a little, while "Cabeca Feita," with a guest appearance by Luiz Gonzaga, is more rooted. However, all that good will is quickly erased by "Musa de Qualquer Estacao," which sounds like part of the cheap soundtrack to a particularly cheesy '80s flick. Milton Nascimento's "Quem Pereguntou Por Mim" offers a breathing space of quality, but that's soon over and it's time for the perky final cut, "Onde Esta O Dinhiero." You have to feel sorry for her, being represented by these cuts, the vast majority of which she'd probably rather forget.